A former registered UK and overseas nurse is set to perform his fabulously funny one-man comedy show at the weekend. 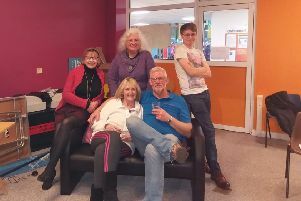 Rob Gee’s ‘Forget Me Not’ play is set to be staged at Long Clawson Village Hall on Sunday. It is a murder mystery set on an Alzheimer’s ward and says a lot about how we treat and perceive people with dementia. As a student nurse, Rob spent three months on a challenging behaviour ward for people with late stage Alzheimer’s. Largely based on Rob’s experiences, many of the stories depicted in the show are true. Except the murders! Tickets for ‘Forget Me Not’ are £8 for adults and £5 for anyone 17 and under (the recommended youngest age is 12).